PNAs are synthetic DNA analogs in which the phosphodiester backbone is replaced by repetitive units of N-(2-aminoethyl) glycine to which the purine and pyrimidine bases are attached via a methyl carbonyl linker (Figure. 1). The PNA molecules can routinely be labelled with biotin or various fluorophores. 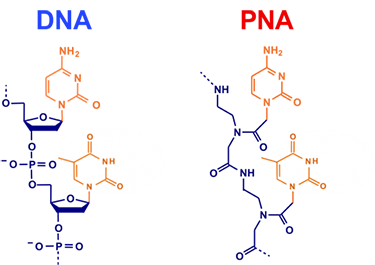 The unique chemical makeup provides PNA with unique hybridization characteristics. Unlike DNA and RNA, the PNA backbone is not charged. Consequently, there is no electrostatic repulsion when PNA hybridizes to its target nucleic acid sequence, giving a higher stability to the PNA-DNA or PNA-RNA duplexes than the natural homo- or heteroduplexes. This greater stability results in higher thermal melting temperature (Tm) values than is observed for DNA-DNA or DNA-RNA duplexes. An additional consequence of the polyamide backbone is that PNAs hybridize virtually independently of the salt concentration. Thus, the Tm of PNA-DNA duplex is barely affected by low ionic strength. This significantly facilitates the hybridization with the PNAs. The unnatural backbone of PNAs also means that PNAs are particularly resistant to protease and nuclease degradation. Because of this resistance to the enzyme degradation, the lifetime of PNAs is extended both in vivo and in vitro. Also, PNAs are not recognized by polymerases and therefore cannot be directly used as primers or be copied. The artificially synthesized biopolymer PNA is a powerful biomolecular tool in the molecular genetic diagnostics with a wide range of vital applications. Due to the ability to interact with the selected target with large sequence specificity in a gene sequence, PNAs are of great interest in wide range of applications in medicinal and biotechnological areas. They are highly promising in the expansion of gene therapeutic agents, diagnostic and molecular tools for genetic analysis. It was also indicated by in vitro studies that PNAs could inhibit both transcription and translation of genes to which they have been targeted which guarantee their use as antigene and antisense agents. 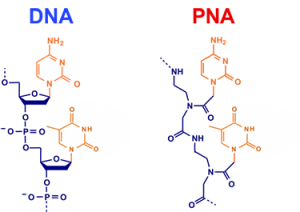 PNA molecules were first used in antigene and antisense assays. Several in vitro studies demonstrated the ability of PNAs to inhibit both eukaryotic translation and transcription. PNA-mediated inhibition of gene transcription is mainly due to the formation of strand-invaded complexes or strand displacement in DNA targets. PNA targeted against the promoter region of a gene can form stable PNA–DNA complexes that restrict the DNA access of the polymerase, whereas PNA complexes located far from the promoter can block the polymerase progression and lead to the production of truncated RNA transcripts. One of the serious problem which is emerging at an alarming rate is the increasing multidrug resistant bacteria. These bacterial pathogens exhibit resistance towards conventional antibiotics due to excessive use of these antibiotics and resistance genes transfer within the bacteria. Researchers desperately require new antibacterial drugs for the treatment of patients infected with drug resistant bacteria. Antisense PNAs as antibacterial agents were found to treat infections caused by multidrug resistant bacteria. PRF-1 signal is responsible for synthesizing RNA replicase polyproteins in virus for genome replication, especially for severe acute respiratory syndrome coronavirus replication. Lee et al. evaluated the potential antiviral effect of APNAs with RNA sequence on the PRF-1 signal as target. In medical and biological research laboratories, polymerase chain reaction (PCR) is a frequent technique to amplify a DNA target sequence, generating thousands of copies for a variety of biomedical applications. PNA-mediated PCR clamping was also used for the amplification and consequently identification of minor allele in blood chimerism whereas direct sequencing of ordinary PCR product could not identify it. Techniques like PNA-FISH are used for the specific and selective identification of S. aureus. PNA-FISH methodology was also used for the diagnosis of bacterial vaginosis which is a common vaginal infection. The method was found to be time saving, highly specific and provided a valuable and trustful diagnostic tool. PNA-FISH was found to be useful for the detection of pathogenic oomycete Aphanomyces invadans which is responsible for ulcerative mycosis, a skin disease caused by a fungus-like agent of wild and cultured fish. In another study, PNA probe-FISH assay was used for detecting mycobacteria with great specificity and sensitivity which helps in the fast and effective treatment of tuberculosis. During past few decades, biosensor technology has gained considerable attention in playing a significant analytical role in different industrial and academic applications especially in certain areas like medical, environmental, food, quarantine control, safety, security, as well as defense. Singh et al. reviewed the use of PNA based biosensors that provide rapid, selective, sensitive, cost effective, simple, and precise detection of DNA hybridization. These biosensors are quite functional in perceiving targeted genes which are responsible for particular disease. Colorimetric assay is another important method of DNA detection which is based on the aggregation of unmodified metallic nanoparticles. In this hybridization based method, charged neutral PNA were used as a “coagulant” of citrate anion-coated particles and the assay was validated using gold (Au) and silver (Ag) nanoparticles (NPs). It was found that for discriminating single-base-mismatch, the Ag NPs possess greater sensitivity than Au NPs, further improving the accuracy of result with the use of the multiple aggregation signatures from the two types of nanoparticles. SPR imaging enhanced by ultrasensitive nanoparticles also uses PNA probes for detecting single-nucleotide mismatches in DNA sequences with greater selectivity. Paulasova, P., & Pellestor, F. (2004, October). The peptide nucleic acids (PNAs): a new generation of probes for genetic and cytogenetic analyses. In Annales de genetique (Vol. 47, No. 4, pp. 349-358). Elsevier Masson. Gupta, A., Mishra, A., & Puri, N. (2017). Peptide nucleic acids: advanced tools for biomedical applications. Journal of biotechnology, 259, 148-159.